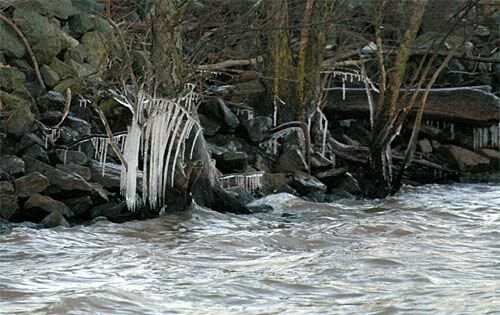 The story of the 14th annual York/Rock Hill Christmas Bird Count (CBC) is summed up perfectly in the sunrise photo above of choppy waves on Lake Wylie breaking against the shore so violently that icicles formed on overhanging branches; to put it succinctly, the day was brutally cold and unbearably windy. At first light the thermometer was stuck at 14 degrees, and northwesterly gusts of 25 mph made it impossible to scan the lake's turbulent waters for more than a few minutes. Instead of balmy December weather we've had for many previous York/Rock Hill counts, the 2004 foray was marked by bone-chilling cold that--believe it or not--froze the focusing wheel on our binoculars! Nonetheless, we had a record turnout of participants on 20 December 2004 with 11 stalwart souls showing up to seek out local birds for all or part of the day--up from the previous high of nine participants. Despite this mass of mostly expert birders, the group tallied only 3,274 individual birds (well below the average of 6,380) representing 70 species (slightly above the 14-year average of 65.5). It didn't help that no big flocks of American Robins or Common Grackles showed to pad our numbers. Even so, our tallies equaled or exceeded the 14-year average number of individuals for 42 of the 70 species reported in 2004. On hand to assist in the count were veterans Bob Olson (10 years of participation) and Susan Holland (8 years), Carolyn (5 years) and Emile Russett (4 years), Dave Callopy (2 years), and compiler Bill Hilton Jr. (14 years)--plus newcomers Chris Dewey, Jim Johnston, Steve Patterson, Paula Staudt, and Carol Schumacher (who came all the way from Winona, Minnesota with the mistaken belief she would be able to warm up during the York/Rock Hill CBC). Perhaps the high point of the day came when Chris and Carol encountered a covey of Northern Bobwhite--the first time this species has ever been seen during our official York/Rock Hill CBC. Bobwhite quail, formerly quite common throughout the Piedmont, have been declining steadily, mostly because of loss of farmland and old fields where they once thrived. 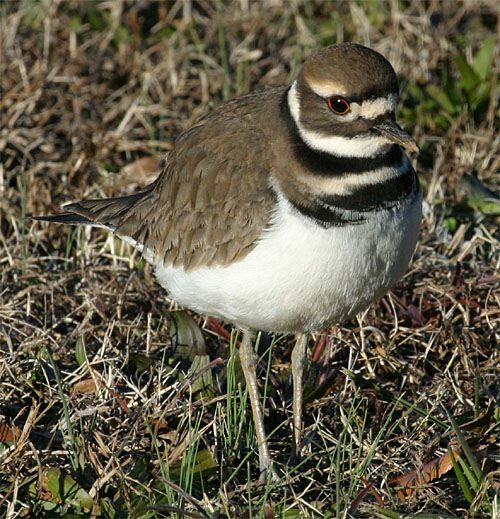 This year's bobwhites brought our 14-year species total to 106, out of approximately 125 species that might reasonably be expected in the area during winter months. Record high numbers were set for ten species (in RED on the table below), and we tied records for another three species (in GREEN). The most significant increase of the day came from Vesper Sparrows--a species that's getting harder to find across its range; 34 seen this year eclipsed the old record of one individual observed in 2000. Also of interest were 119 Killdeer (above) that nearly doubled the old record of 64; this was one of few species seen by all participants no matter which count sector they were monitoring. After lunch everyone also got to observe an adult female Rufous Hummingbird that has been frequenting a Rock Hill feeder since mid-October; it's the bird banded at the same location last year, recaptured 17 November 2004, and featured in a photo on the 2003 York/Rock Hill CBC report. 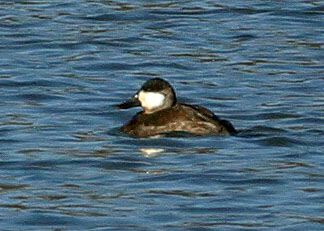 A flock of 15 Green-winged Teal and 10 Hooded Mergansers cruised around an impoundment not far from Hilton Pond Center. All these waterfowl were particularly colorful in the crisp winter air--the male teal were breathtaking--and the mergansers were extremely active, diving and coming up repeatedly with 3-inch-long panfish they swallowed with gusto. A trio of Ruddy Ducks (male in winter plumage at right) were bobbing around in the wind on another small pond, also diving for goodies. These ducks were likely after plant matter and small critters other than fish. We spotted a female Ruby-crowned Kinglet flitting about in a pine tree, gleaning for tiny insects at Hilton Pond Center. As we watched, we noticed a shiny aluminum band on her right leg--interesting because we haven't banded a kinglet at the Center since December 2003. 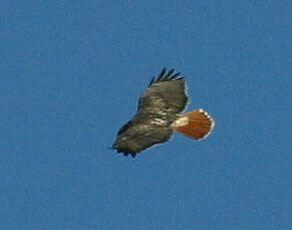 This was either one of our old birds returning or one that was banded somewhere else. Unfortunately, we couldn't run mist nets and conduct the CBC at the same time, so we wre unable to catch the bird to find the answer to this little mystery. On the edge of one frigid pond a Great Blue Heron (below right) was wading about as deeply as it could without getting its body wet. We suspect that having its legs completely submerged was the best way to keep them relatively warm. The water temperature had to be higher than 32 degrees, while the air temperature was below freezing and the wind chill would have sucked heat away from the heron's naked, wet legs. One of our biggest personal CBC disappointments is the continuing decline of Turkey Vultures and Black Vultures at the York County landfill. This decrease began in the mid-1990s when the county shifted from open dumping of household trash (i.e., vulture food) to containerized transport of waste to some distant landfill. Even the numbers of gulls at the dump have spiralled downward from nearly 4,000 individuals in 1991 to just a few hundred the past four years. We miss the vultures, but we're much less disappointed that there are fewer gulls. 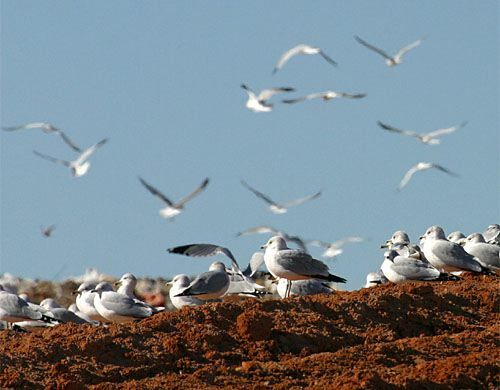 In the photo below, a well-fed flock of Ring-billed Gulls rests atop a mound of recently plowed red clay, a Piedmont trademark; their relatives fly to and from a huge pile of trash at left in the background. If you're interested in helping survey and learn about Piedmont birds, our annual count is typically the Saturday before Christmas--unless that day is Christmas Eve or some other unavoidable conflict comes up--so get out next year's calendar and reserve 17 December 2005; 19 December will be the back-up date. Maybe you'll be the person that spots a new vagrant hummingbird at Hilton Pond Center or finds some other rare species within the rest of the territory that makes up the York/Rock Hill Christmas Bird Count. --The after-hatch-year male Red-winged Blackbird captured in a pull-string trap on 18 Dec was dining on black sunflower seeds. 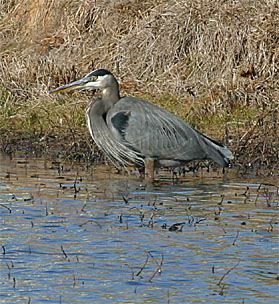 He became only the 22nd red-wing banded at Hilton Pond Center since 1982.